The Codex Sinaiticus, which contains the text of the New Testament and includes the Epistle of Barnabas. However, its place, along with the Shepherd of Hermas, at the end of the Codex Sinaiticus (330-350 C.E.) shows that the Epistle of Barnabas was highly regarded in some Christian communities. Saint Jerome considered the letter "valuable for the edification of the church," but stipulated that it was "reckoned among the apocryphal writings." In the West the letter stands beside the Epistle of James in several Latin manuscripts of the New Testament. 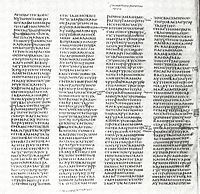 In the East, a list maintained by the ninth-century patriarch of Jerusalem mentions the epistle in a list of books that are antilegomena—"disputed"—along with the Revelation of John, the Revelation of Peter and the Gospel of the Hebrews. In this way, the letter found its way into the category in which it now stands, useful for study by Christians, but not scripture. The epistle was lost until the early nineteenth century. It has since come to be included in the modern collections of the Apostolic Fathers. Why it was finally excluded is uncertain. Those who rejected it do not specify their reasons. Generally, to qualify as scriptural, a writing had to be of apostolic origin (meaning it was written either by an apostle or a hearer of an apostle), it had to be orthodox in its teaching, and it had to be accepted by a large number of congregations. Traditionally, this epistle is ascribed to Barnabas, but it does not claim to be by him. 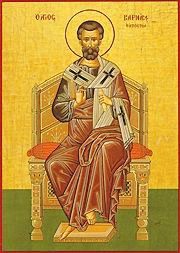 Nor is it likely that Barnabas—who according to Paul was more "Jewish" than Paul himself (Gal. 2)—would hold the views expressed in this letter. One reason for its non-inclusion may be that it simply was not very popular. Another likely, though speculative, explanation is that the Church Fathers recognized that the epistle's view of God's covenant with the Jews does not accord with the teachings of Saint Paul, the Book of Acts, or the Epistle to the Hebrews. Paul affirmed that God had indeed formed a covenant with the Jews, which had now been extended to the Christians, while the Book of Acts affirmed that Paul himself had his disciple Timothy circumcised because he had a Jewish mother (Acts 16:1-3). Barnabas held that circumcision had always been meant to be understood allegorically, and that the Jews had never contracted a covenant with God because of their sins, starting with their worship of the golden calf at Sinai. Barnabas goes even farther than Hebrews—which held that the covenant no longer applied to Jews but only to Christians—by claiming that the Jews had never been the covenanted people of God. Although the epistle was never condemned as heretical, this view was clearly not orthodox. In the modern era, the first editor of the epistle, Hugo Menardus (1645), advocated the genuineness of its ascription to Barnabas, but the opinion today is almost universal that Barnabas was not the writer. The Epistle of Barnabas contains fews clues to its true author or to the specific audience for whom it was intended, beyond the fact that they appear to be Gentile Christians who were liable to be influenced by Christian Judaism. Although traditionally ascribed to Barnabas, the partner of Saint Paul at Antioch, the letter itself nowhere claims to be written by him. The attribution seems to result from the letter's focus on refuting Christian Judaism, which was a major issue at Antioch. Internal evidence suggests that Barnabas was written after the destruction of the Temple of Jerusalem in 70 C.E. and before the Bar Kochba Revolt of 132 C.E. The place of its origin remains an open question, although the Greek-speaking territory of the Eastern Mediterranean is most likely. 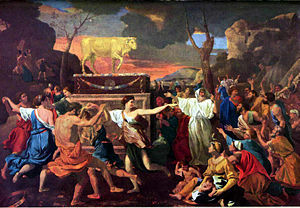 The Israelites' sin with the Golden Calf was a crucial event for the Epistle of Barnabas, evidencing the supposed fact that the Jews had never established a covenant with God. The Old Testament itself teaches that God forgive the Israelites for this and reestablished his covenant with them centering on the Tabernacle. Although the work is not Gnostic in a heterodox sense, the author intends to impart to his readers the type of perfect gnosis (special knowledge). His concern is that his audience must realize that the Christians, rather than Jews, are the only true people of God's covenant. Like the author of the Epistle to the Hebrews, "Barnabas" holds that the Jewish scriptures served to foreshadow Jesus and Christianity. He goes well beyond Hebrews, however, by arguing not that the God's covenant with the Jews has been transferred to the Christians, but that the Jewish people had never actually established a covenant with God. He asserts that their sin of turning to the Golden Calf at Sinai blocked them from entering into the covenant with God and that thereafter they completely misunderstood the true meaning of the Mosaic Law. The promises of the covenant, he maintains, therefore belong only to the Christians (e.g. 4:6-8). The practice of circumcision and the entire Jewish sacrificial and ceremonial system are due to misunderstanding, as they were meant to be interpreted allegorically (chapters 9-10). The author's concern, above all, seems to be the influence of Judaizing Christians and those of his readers who might be swayed by their teaching. In no other writing of that early time is the separation of the Gentile Christians from observant Jews so insistently championed. Although he is a thorough opponent of Jewish legalism, "Barnabas" is by no means an antinomist tract. The closing Two Ways section (chapters 18-21), for example, contain a series of moral injunctions. At many points the epistle is quite Pauline, particularly in its concept of atonement. The author quotes liberally from the Old Testament, including the apocryphal books. He cites material resembling 4 Esdras (12.1) and 1 Enoch (4.3; 16.5), which did not become part of the Biblical canon in most traditions. He also quotes from the New Testament gospels twice (4:14, 5:9), and is in general agreement with the New Testament presentation of salvation history. The first part of the work (chapters 1-5) is a hortatory address. In the evil days that are now at hand, in which the end of the world and the Last Judgment will soon appear, the faithful are to practice the moral virtues and shun sin. However, they must also be free from the bonds of the Jewish ceremonial law. The second part (chapters 5-17) is more speculative, concentrating on the idea of the freedom of Christians from the Mosaic regulations and the real nature, in the author's opinion, of the Old Testament. He attempts to demonstrate that the ordinances of the Law should be understood allegorically as referring to the Christian virtues and sacraments. He emphasizes passages of the Old Testament which he believes prefigure Jesus Christ and the church. The author then enlarges on the exhortations of the first part of the epistle by apparently borrowing directly from the Didache's description of the "Two Ways"—the ways of light and darkness (chapters 18-20). Ironically, several experts have proposed that the teaching of the Two Ways (Didache, ch. 1-6), was originally a manual of instruction used for the initiation of proselytes in the Jewish synagogues. In the early nineteenth century, eight manuscripts, all derived from a common source (G), were known in Western European libraries. None of them contained the current chapters one to five . The fourth-century Codex Sinaiticus, discovered in 1844 at the Monastery of Saint Catherine in Egypt, contains a more complete manuscript of the text. It appended the epistle and the Shepherd of Hermas to the canonical books of the New Testament. The eleventh-century Codex Hierosolymitanus ("Jerusalem Codex"), which includes the Didache, is another witness to the full text. This Greek manuscript was discovered at Constantinople in 1873. There is also an old Latin version of the first 17 chapters which dates, perhaps, to no later than the end of the fourth century and is preserved in a single ninth century manuscript (St Petersburg, Q.v.I.39). This is sometimes significantly shorter than the Greek version, often agreeing with the G manuscripts. There are also brief citations from the epistle in the writings of Clement of Alexandria. ↑ The Canon of the New Testament Retrieved July 3, 2008. ↑ Didache JewishEncyclopedia.com. Retrieved May 1, 2006. Kraft, Robert A. Barnabas and the Didache: Volume 3 of The Apostolic Fathers: A New Translation and Commentary, edited by Robert Grant. New York: Thomas Nelson and Sons, 1965. ccat.sas.upenn.edu Retrieved June 3, 2008. History of "Epistle of Barnabas"
This page was last modified on 19 August 2017, at 16:32.